Henryk Szeryng was an extraordinary Polish violinist, teacher, and composer born on September 22, 1918 (Heifetz was 17 years old.) He began his violin studies at age 7 with Maurice Frenkel and, after his prodigious talent was recognized, continued with Carl Flesch in Germany (1929-1932) and Thibaud in Paris later on. He made a sensational debut in Warsaw in 1933 (in his early teens) and started concertizing right away, even while continuing further studies. In 1937, he graduated from the Paris Conservatory. 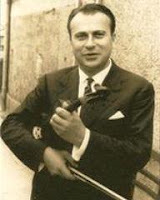 During the Second World War, Szeryng served as an interpreter but also played more than 300 concerts for the Allied troops. In 1946, he became a naturalized Mexican citizen in appreciation for Mexico's efforts to take in several thousand Polish war refugees. He was the only violinist who travelled on a diplomatic passport after he was appointed Ambassador for Cultural Affairs by the Mexican Government. While continuing to concertize internationally, he taught at the National Conservatory in Mexico City for many years. It is not clear to me whether he was fluent in six, seven, or eight languages - there are varying accounts. In addition to being a virtuoso of the highest caliber, he was a great humanitarian and philanthropist. There is insufficient space here to post even a few of this phenomenal violinist's accomplishments. I must therefore refer you to his official website. There are many, many recordings by this artist (among them 2 sets of the Bach Sonatas and Partitas) and several videos on YouTube. As far as I know, he was one of only four concert violinists who played three concerti in a single program - Yehudi Menuhin, Raymond Cohen, and Szymon Goldberg were the other three. One thing which is not well known is that Szeryng also composed concertos and chamber music. Among his violins, his favorite seems to have been the famous LeDuc Guarnerius Del Gesu. He also owned a copy of the Messiah Stradivarius (by Vuillaume, who made many copies of that instrument.) His King David Stradivarius was bequeathed to the State of Israel. Szeryng died unexpectedly on March 8, 1988 at age 70. Heifetz died one year earlier.